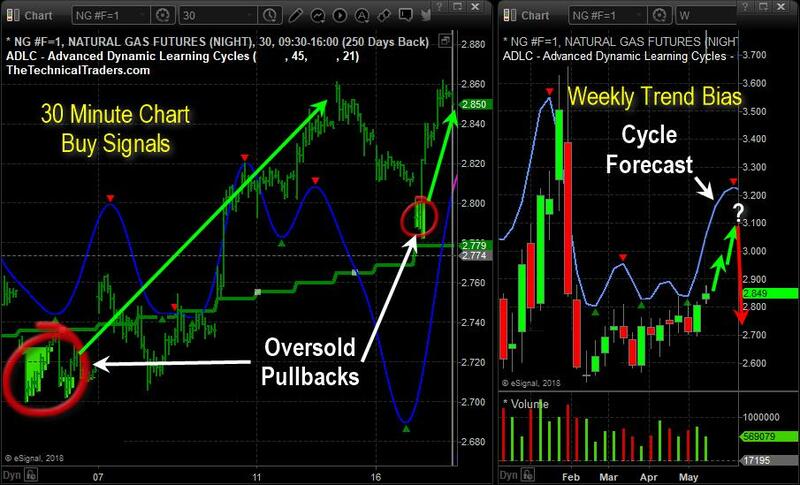 A traditional seasonal pattern in natural gas has set up, and may result in a tremendous trading opportunity, writes Chris Vermeulen of Technical Traders. Recently, we have alerted our members to this play, which is already up over 16%. Additionally, our advanced price modeling systems and Adaptive Dynamic Learning Cycles have recently triggered another buy entry trade (see the chart) with oversold pullbacks. Our research team has been following the energy sector quite intensely, with oil and natural gas making an impressive move. Our belief is that natural gas will continue to climb higher, moving well above the $3.00 level before the end of this month, as well as potentially pushing well above the $3.20 level on continued price advances in energy. With global concern globally driving energy supply fear and pushing energy prices higher. This seasonal pattern indicates the potential for some strong upside price moves. Smart traders are already positioned for this move, yet there is still quite a bit of opportunity for current entry point. Any upside price move from current levels to above $3.00 would reflect an additional 46% price gain, and any advance above $3.20 would reflect a 11% price advance. Additionally, our predictive price modeling systems and cycle modeling systems are showing this has the potential for quite a bit more, but we can estimate the $3.003.20 level is a sufficient upside target for this initial move. If you would like help finding trade triggers like this and help knowing what to expect each day in the markets, please visit www.TheTechnicalTraders.com to learn how we can help you take advantage of the opportunities that are presented each week in the markets. Chris Vermeulen has been involved in the markets since 1997 and is the founder of Technical Traders Ltd. He is an internationally recognized technical analyst, trader, and is the author of the book: "7 Steps to Win With Logic." His mission is to help his clients boost their trading performance while reducing market exposure and portfolio volatility. He is a regular speaker on HoweStreet.com, and the FinancialSurvivorNetwork radio shows. Vermeulen also contributes market insight to several financial hubs like StreetWiseReports.com. 1) Statements and opinions expressed are the opinions of Chris Vermeulen and not of Streetwise Reports or its officers. Chris Vermeulen is wholly responsible for the validity of the statements. Streetwise Reports was not involved in any aspect of the article preparation. The author was not paid by Streetwise Reports LLC for this article. Streetwise Reports was not paid by the author to publish or syndicate this article. Technical Traders Disclaimer: This material should not be considered investment advice. Technical Traders Ltd. and its staff are not registered investment advisors. Under no circumstances should any content from websites, articles, videos, seminars, books or emails from Technical Traders Ltd. or its affiliates be used or interpreted as a recommendation to buy or sell any security or commodity contract. Our advice is not tailored to the needs of any subscriber so talk with your investment advisor before making trading decisions. Invest at your own risk. I may or may not have positions in any security mentioned at any time and maybe buy sell or hold said security at any time.